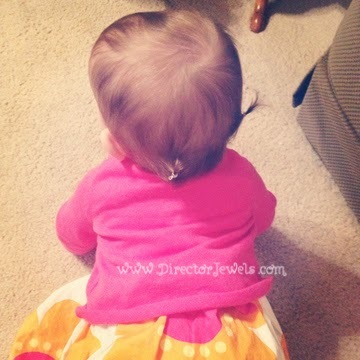 Director Jewels: Wordless Wednesday: Teeny Tiny Baby Pigtails! Oh my goodness. I DIE. Adorable and hilarious! We always joke that Lynley has a skullet because she literally only has hair that you can brush in the back! Hahaha I may have to try a tiny ponytail. Very cute! I can't wait till I'm able to do pig tails in our baby girl's hair.